I’m not the kind of photographer who sets things up, or imagines a photo and then creates it. I’m more the seat-of-the-pants, hope-I’ll-run-across-a-photo kind of photographer. I want to learn Photoshop, but I’ve never used it yet. This takes more luck than skill. You gotta be in the right place at the right time. 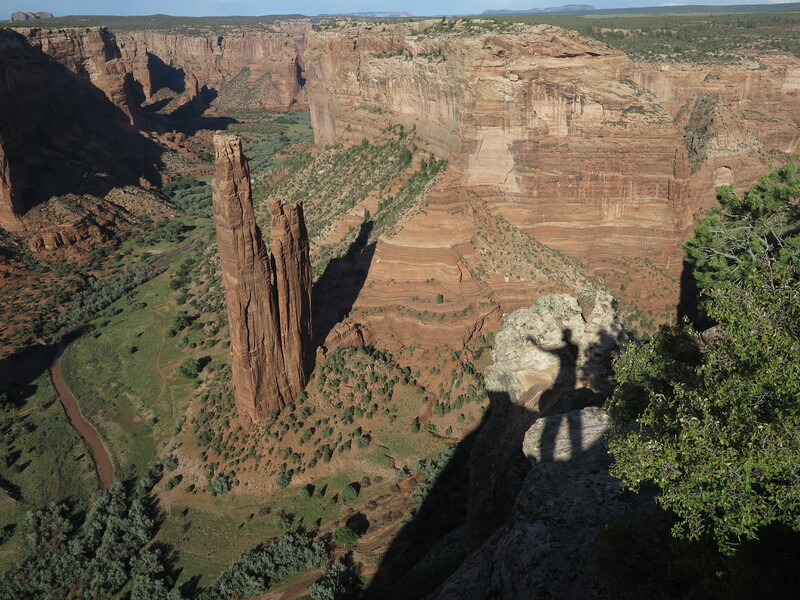 Take this photo for instance, taken in Arizona’s Canyon de Chelly where the Anasazi tribe hung out–grew crops, raised livestock–for a while and then some how…disappeared. No one knows the story. Drought, Apaches, dead dirt? Anyway, here I am peering into their land, when the sun was in the right place to create my shadow below me. This is an awesome pic!! Thanks so much. But as I mentioned…pure luck, and timing. I just happened by at the right time. I have stood there looking way down into the valley below, probably not in the exact spot but close to it. It struck me as looking into another world that is so calm and peaceful…yet mysterious. Beautiful picture. Helen, yes, it is a beautiful spot. And I hiked down into the canyon to the place where the Anasazi had built “apartments” inside a huge cave “up” the vertical rock wall. Who were those guys? Thanks so much. Fun photo to take. At the right place at the right time is always every photographer’s dream. Exactly, and I have to say, I’ve been pretty lucky at finding right places. But I’ve seen some photos lately where photographers dress people up in costumes, take them out to the woods, and somehow take a photo of the model levitating. I like those photos, but I don’t want to spend the time learning how to do it. So I’ll just carry my camera, and wait and pray for luck, I guess.